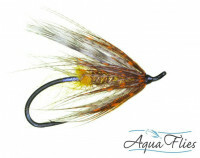 A good swinging fly for October Caddis imitations and as a good summer/fall leech pattern. 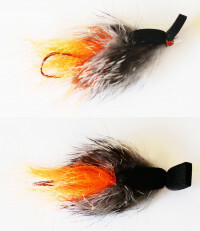 Tied as a string leech. 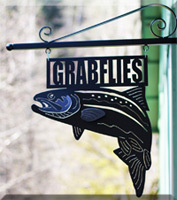 Can be fished like a Moal Leech, but is a more realistic food imitation. Skate it (deer hair head is shaved flat on belly side) or fish it wet. 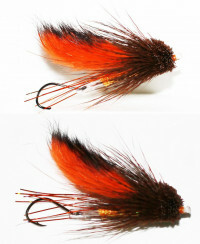 A very effective fall Caddis and Muddler imitation. 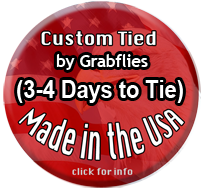 Custom Moal Leeches are tied by Grabflies.com in the good old USA. 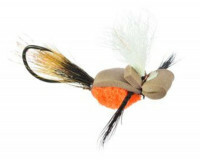 Moal's are tied using the best materials on the market and are tied to last (super glue, Berkley Fireline Braid 15 LB (double over for 30 LB strength) and, quality hooks. Photo of 2 inch October Caddis Moal. 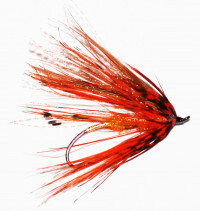 A very good skating and popular pattern for fishing for Steelhead on the surface.